Hello again ladies and gents! 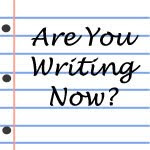 Today, I want to introduce you to the wonderful electronic world of Are You Writing Now?. You see, I was cursing through the blogosphere in my nifty Google car (I swear, switching RSS readers, and putting all my fellow authors' blogs into one was a great idea!) and parked myself for a bit at Patrica Lynne's blog early this month. She was having trouble writing her sequel, needing encouragement to just get up and write. And so I got to thinking, when was the last time I did something really productive for my writing career? NaNoWriMo. And guess what? I still haven't finished it, even though it's been on the last bit of the last chapter for months. So, I thought, pondered, and sent Patrica a bunch of e-mails and we came up with a plan. Why not start a writing accountability group, where we encourage each other towards our goals, act as cheerleaders when needed, and ultimately make sure our fellow writers don't fall into the procrastination hole of death? I've been hanging on to the edge of that one for a while now, as highlighted by the fact that I've been in my PJ's all weekend. Yes, from Friday night till (as I'm planning it) Monday morning when I have to get ready for work. I'm too lazy to change clothes, do you honestly think I've written or edited anything? Nah, might as well start big right? And a long lasting project is a big as it gets. Without further ado, here's the program! 1) At the end of each month (starting in Feburary), write a post about your goals for the next month and how you managed the previous month. (Except of course, for the first month because it's, well, the first month. But I think you guys got that with out me saying so. It's the sugar, it makes me chatty.) Patricia and I are playing around with the idea of award badges. Thoughts? 2) Buddy with with two or three people to be your accountability partners, exchanging twitter and/or facebook accounts. You want more buddies, go for it! But we figure more than one would be best, because I for one know I can be forgetful. (Maybe working on that should have been my New Years Resolution... ) Plus, the life can get in the way. Anywho, these people will be your cheerleaders and guiding angels as you write. Use each other! This is a great way to meet friends and be active in their lives. Partner up with someone with similar goals, or find someone who writes in a different genre to get a wide spectrum of the writing world! 3) Twitter! For immediate help and encouragement, we'll be using hashtags, #areyouwritingnow and the shorter #aywn. It'll also give us a bit of forum to talk in and a way to find each other. Follow me as @GwenTolios and/or Patricia as @patricialynne07. Anyone have a good twitter app I can use for my android phone? I tried TweetDeck but wasn't that fond of it, and I'll probably be crazily checking it to talk with you guys. I'm going through withdrawal from the NaNoChatRooms I utilized back in November. Be prepared to sign up next month! And if you have any suggestions, don't hesitate to speak up. This is to be a tool for all of us, and we want to make sure it works! I've been in my PJs almost all weekend too. Had to get dressed for a bit yesterday. I thought it was law to spend the weekend in your PJs? I like the sound of this. I look forward to seeing further details in Feb! My first question to you is, why have you only had two pieces of cake? For goodness sake, it's 3.30 in the afternoon. What sort of example are you showing to us all to get us into the working/writing mood? Looking forward to finding out more about your group.